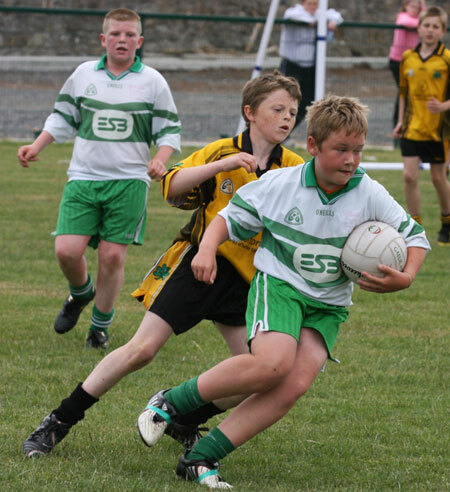 Last Saturday the under 12s of Aodh Ruadh, Bundoran, Melvin Gaels and Erne Gaels came to Ballyshannon to compete in the Willie Rogers tournament. 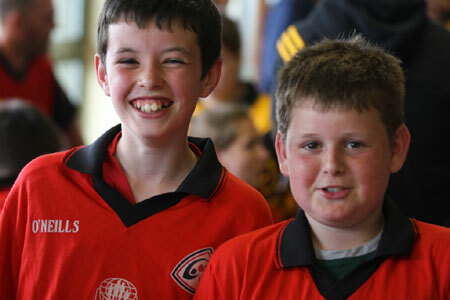 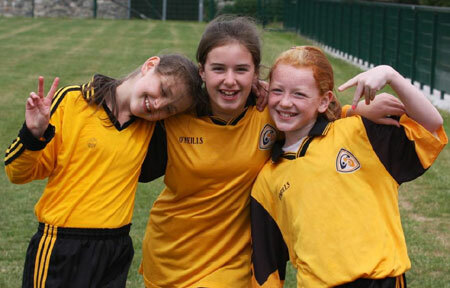 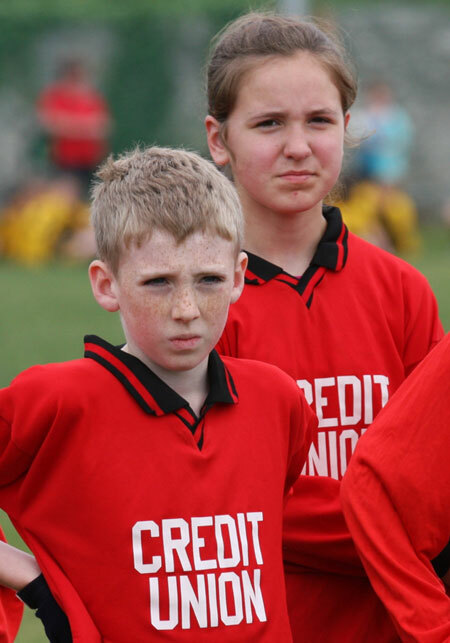 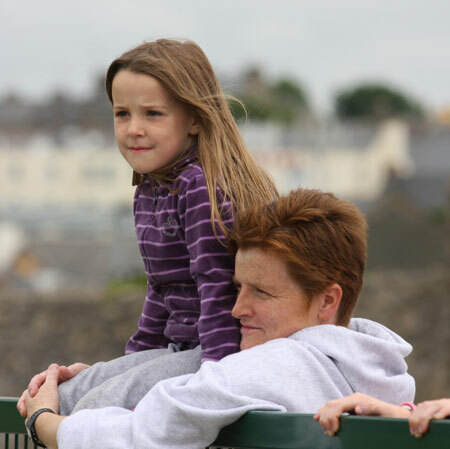 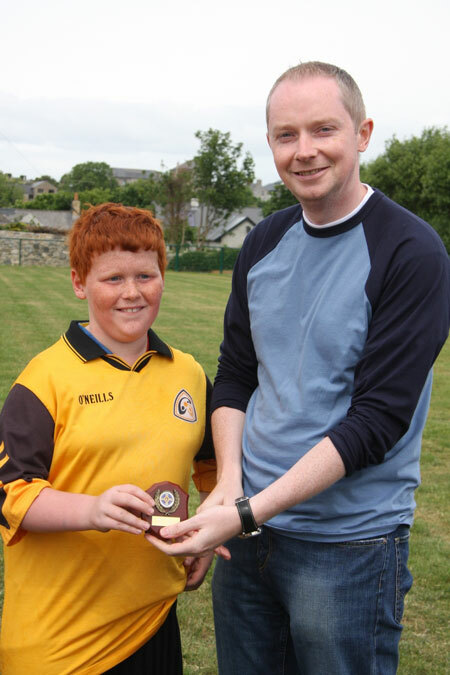 And once again the tournament was favoured with both great weather and great football. 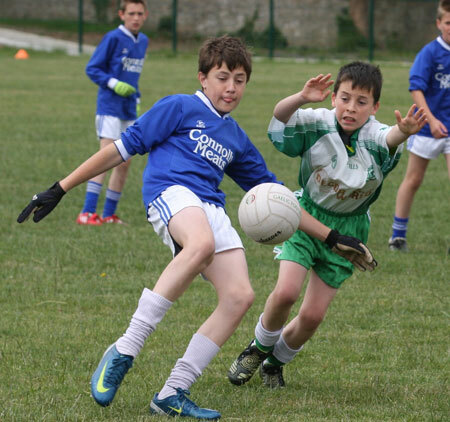 After a tight and competitive round robin section Erne Gaels and Aodh Ruadh topped the table, putting the pair through to the 'A' final. 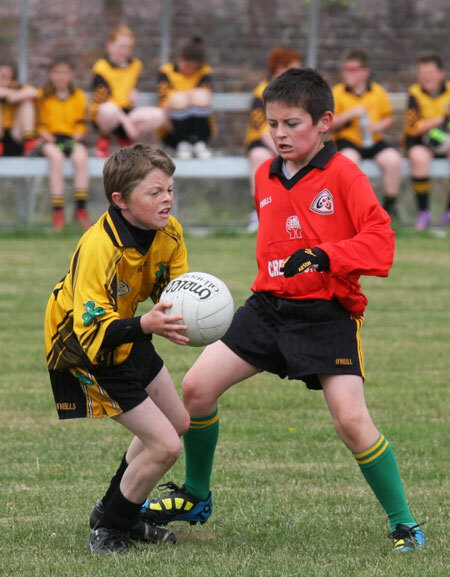 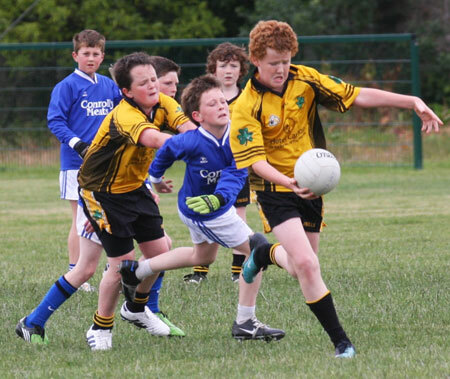 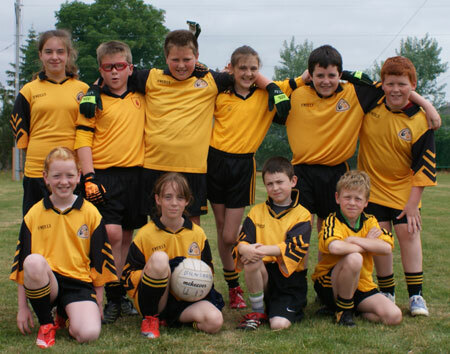 After stumbling in the first game against Melvin Gaels, Aodh Ruadh, had won the final round robin game against Erne Gaels with a powerful display. 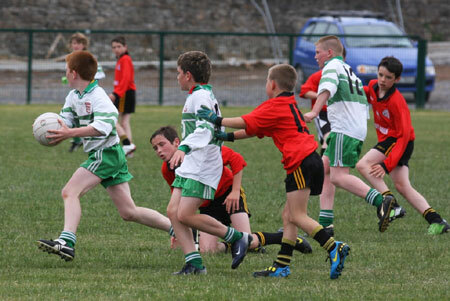 By contrast the Belleek side had been in flying form in the other two games. 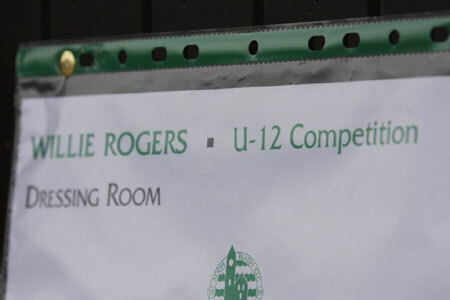 That set it up for a great final. 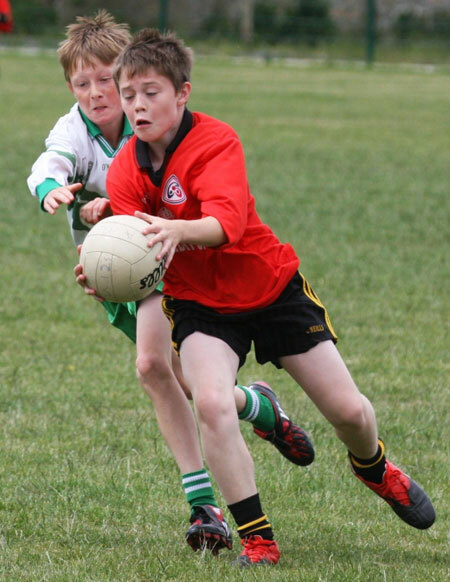 Aodh Ruadh opened well enough, but a big, strong Erne Gaels side had more left in the tank after the round robin stages and they were able to create and take their chances with greater ease than the hosts. 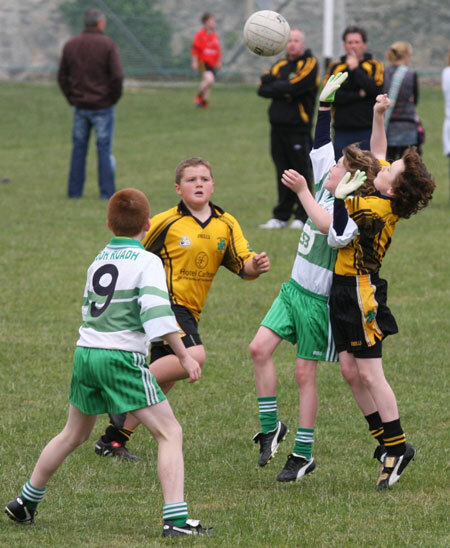 There were great scenes of celebration at the final whistle with Erne Gaels winning by 4-4 to 2-6. 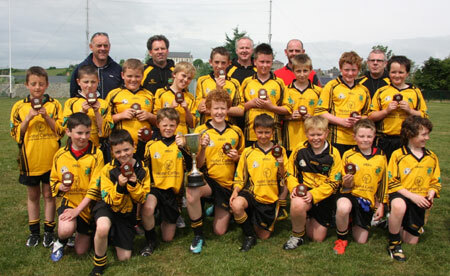 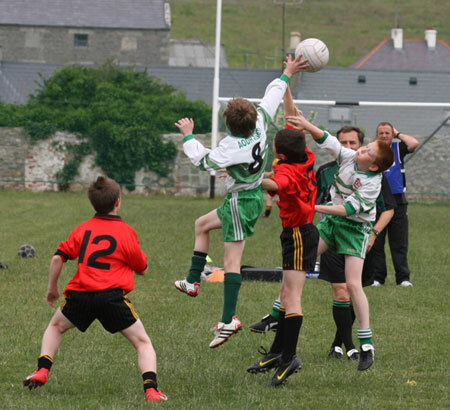 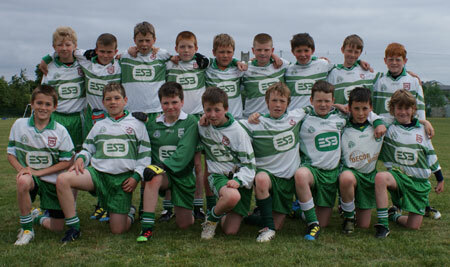 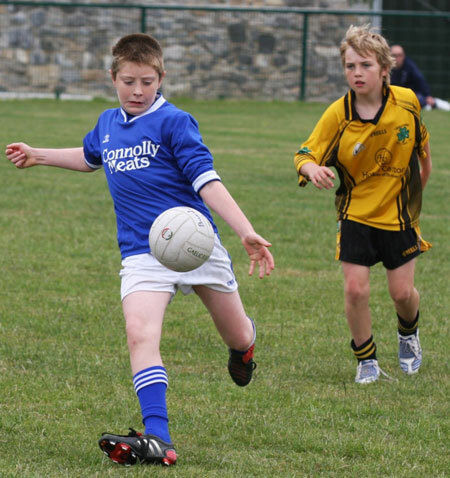 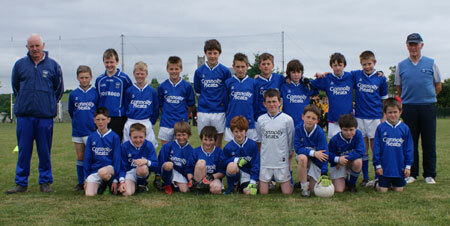 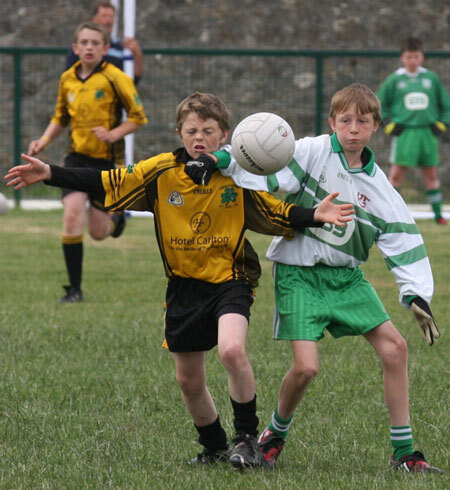 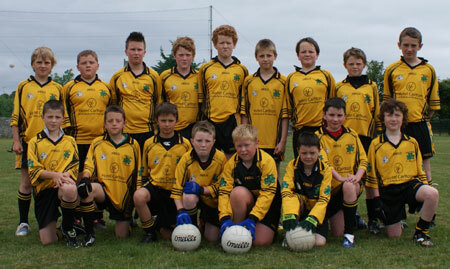 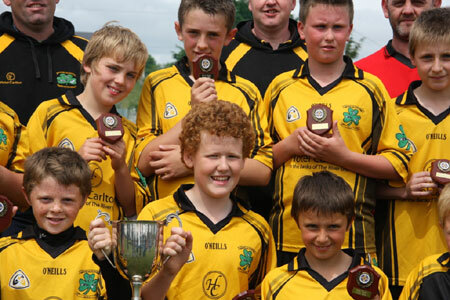 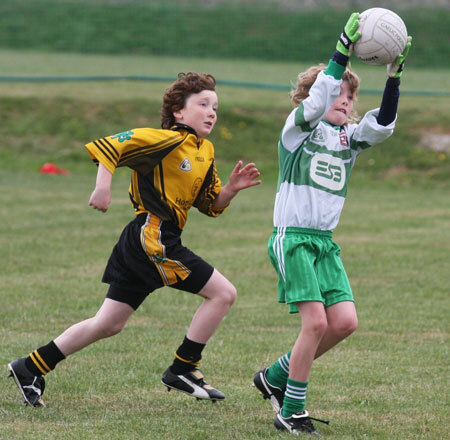 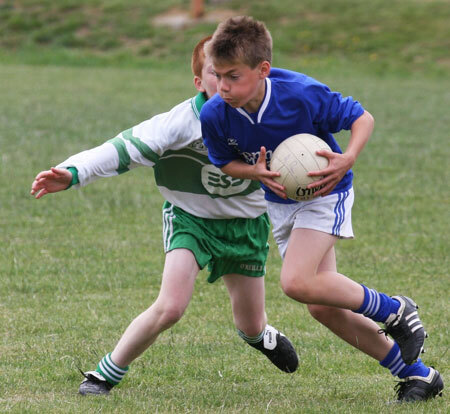 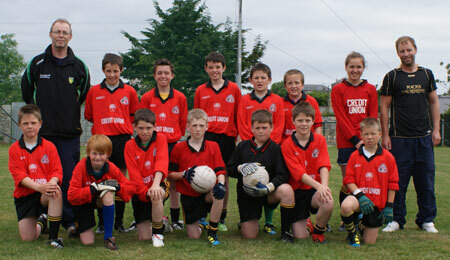 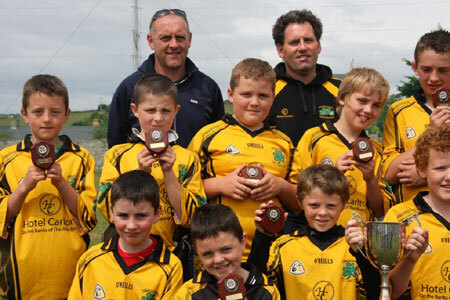 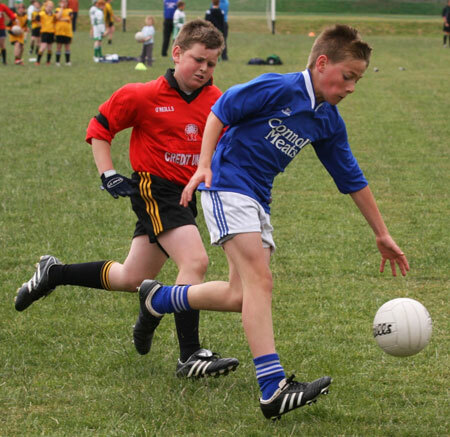 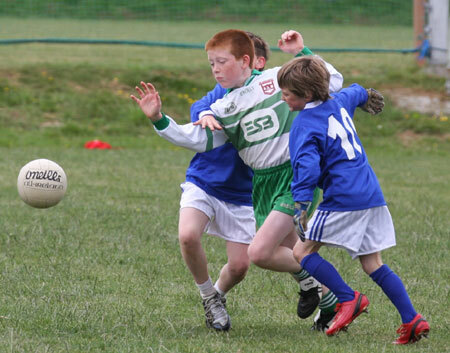 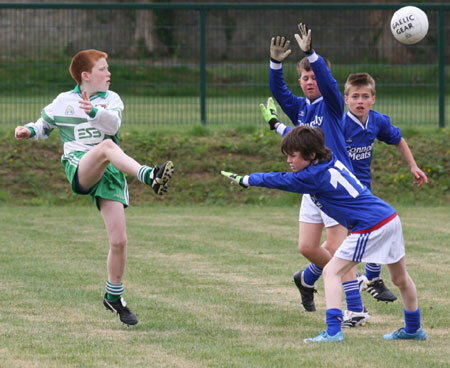 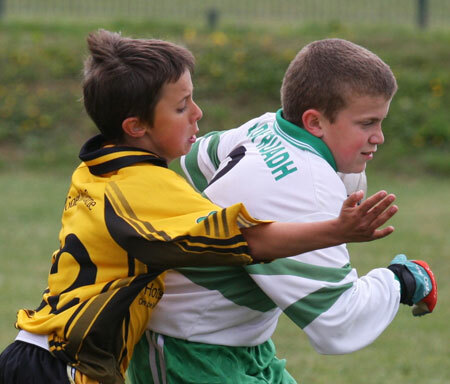 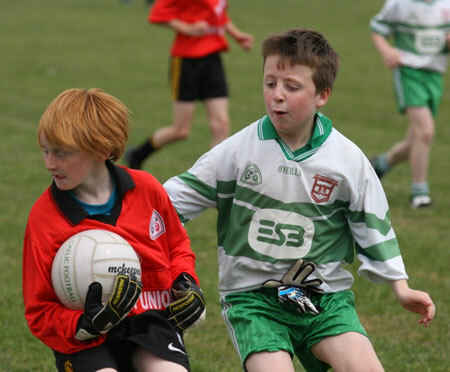 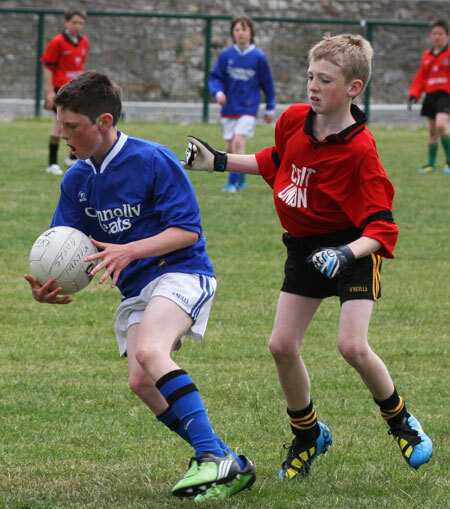 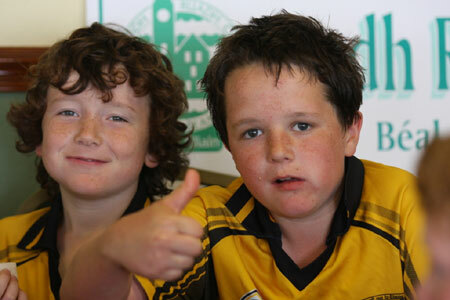 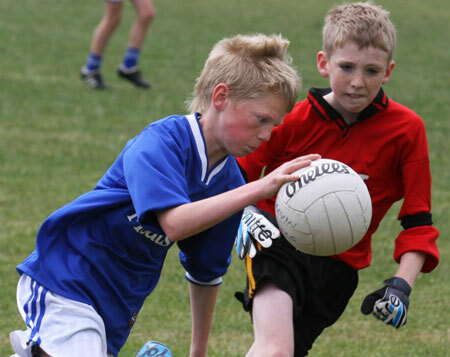 In the 'B' final Bundoran defeated Aodh Ruadh by ten scores to four. 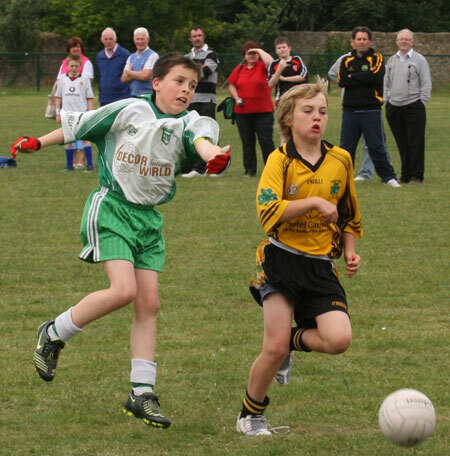 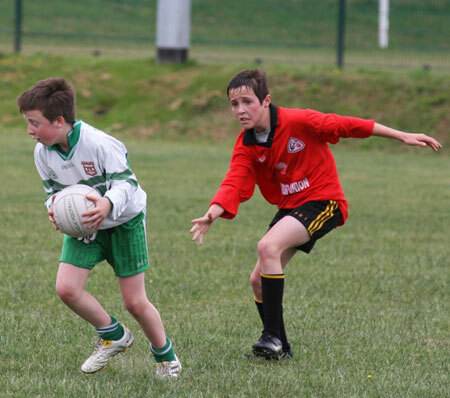 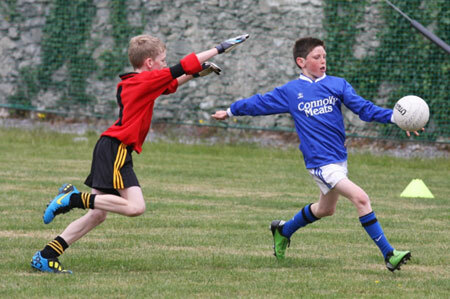 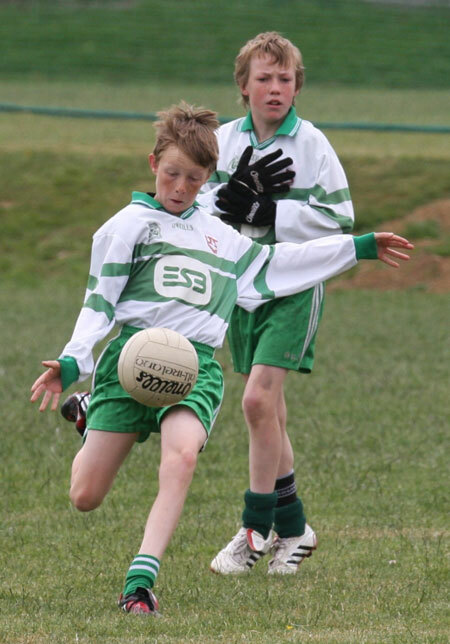 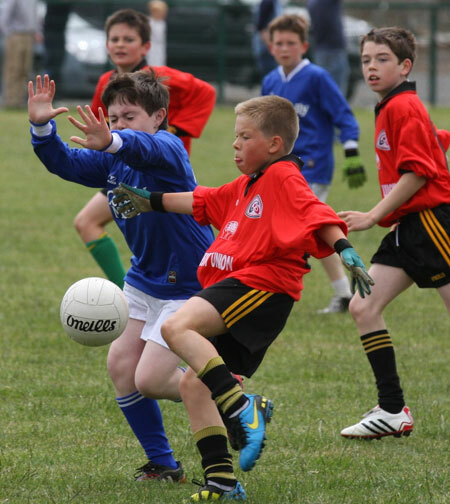 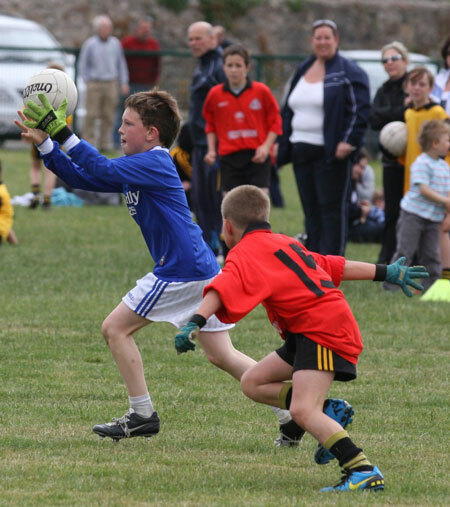 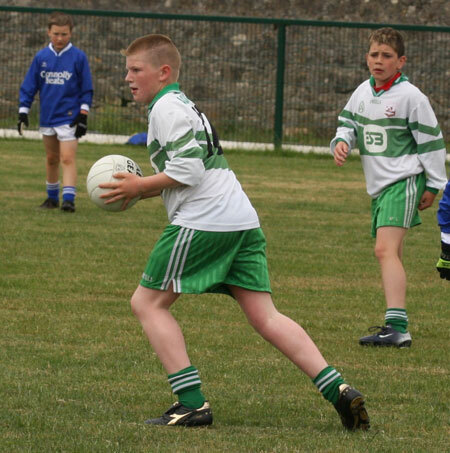 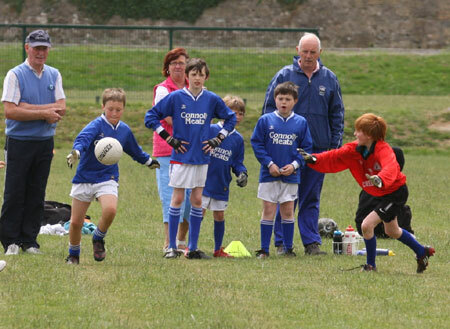 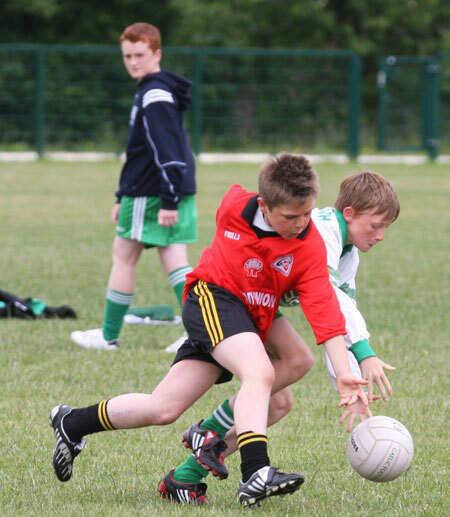 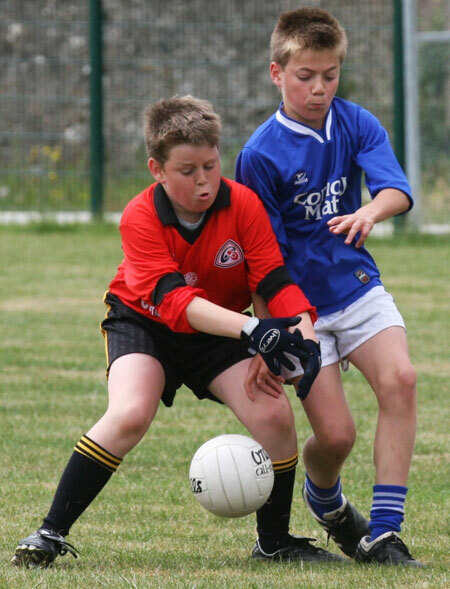 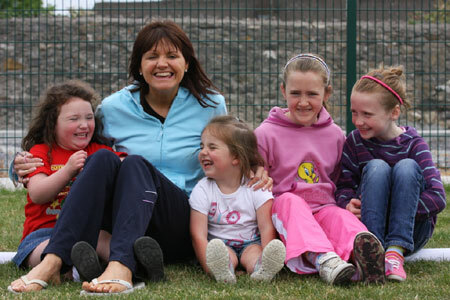 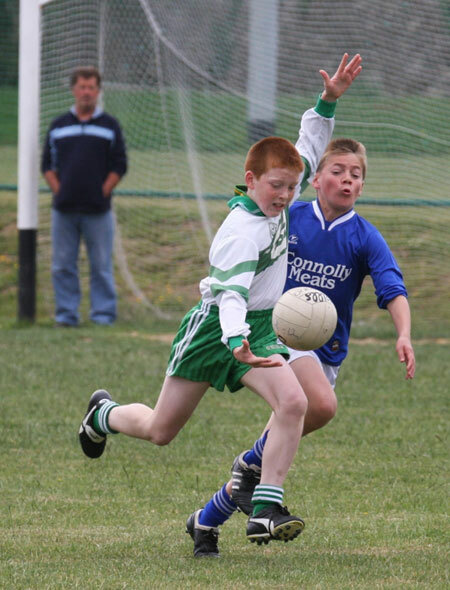 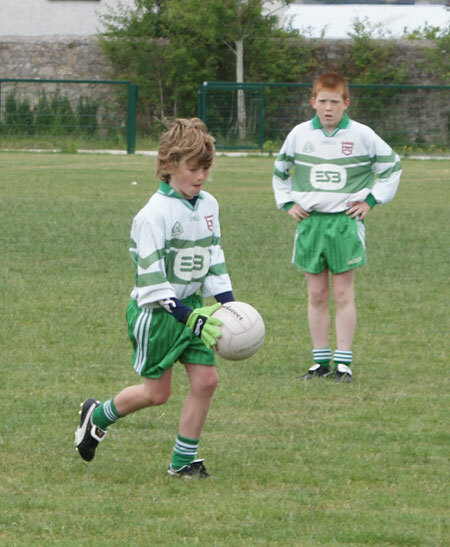 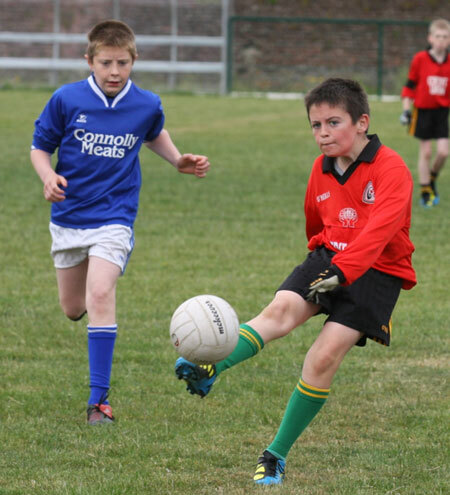 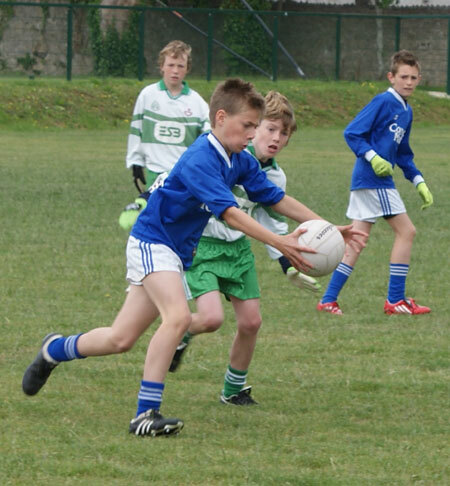 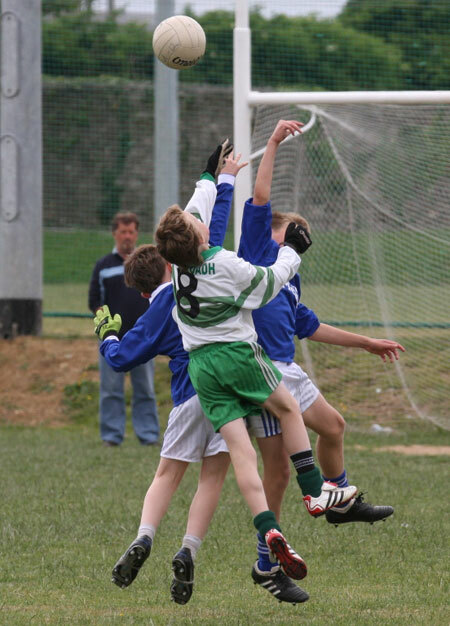 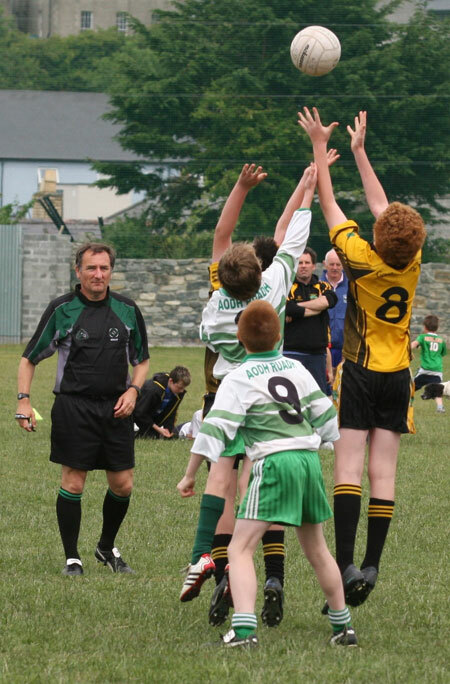 From an Aodh Ruadh perspective there was a super display from Naoise Patton in nets. 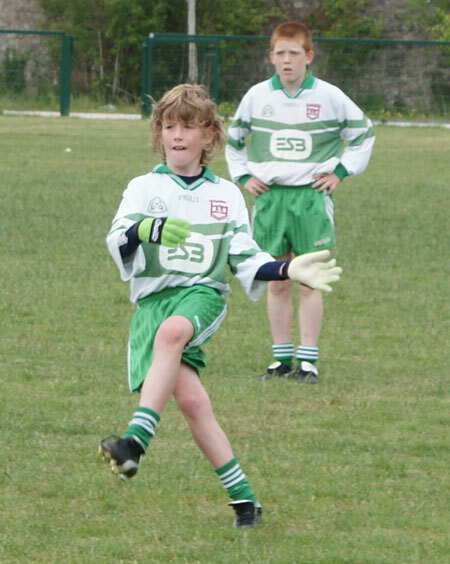 Apart from fine general play he saved two penalties in the group stages. 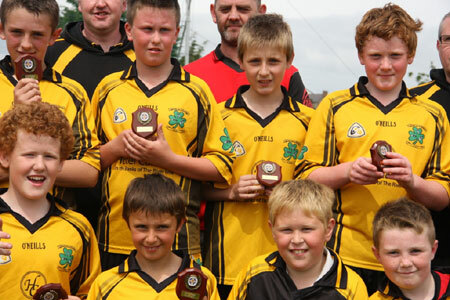 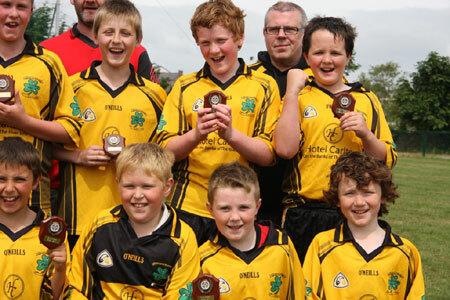 Odhran O'Neill, Ois�n Kerr, Cian McGloin, Shane McGrath, Jimmy Ward and Nathan Boyle were also stand out players for the homesters. 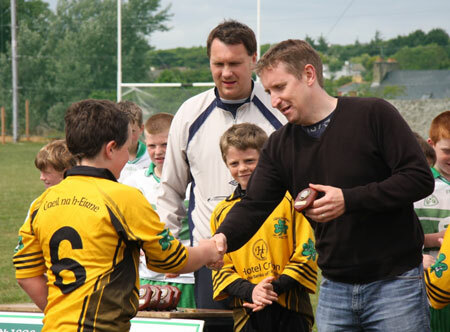 Bord na n�g chairman, Paddy Kelly, compered the prize giving and first introduced Willie Rogers' son, Gavin, to present medals to the B finalists. 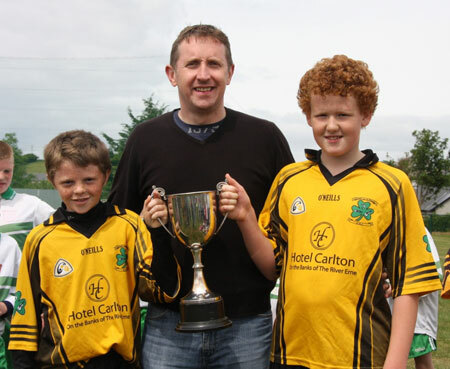 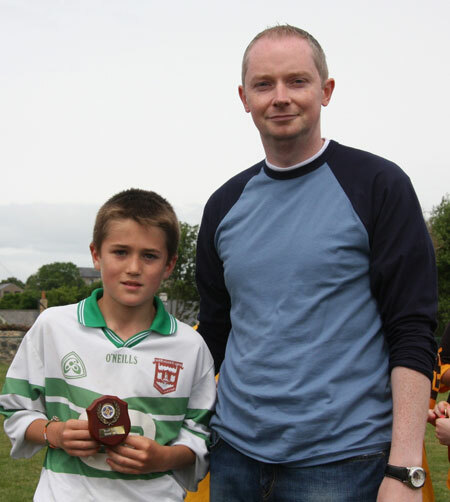 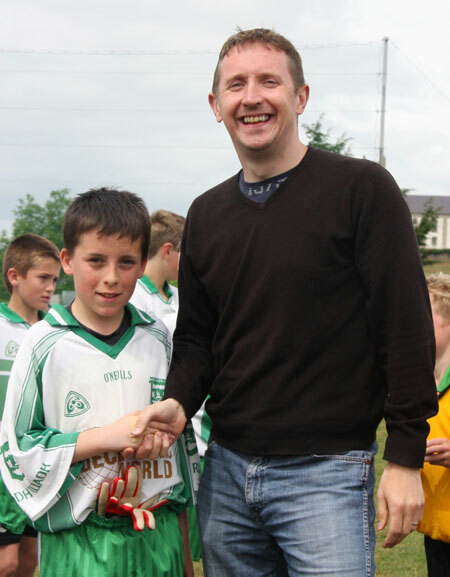 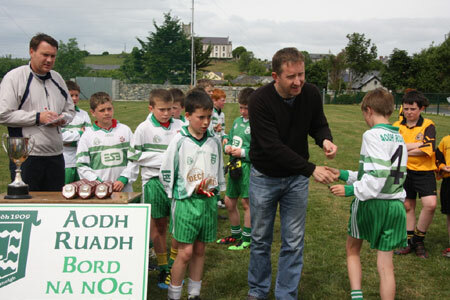 First, runners-up medals to the Aodh Ruadh B team captained by Cian McGloin and then winners' medals to the Bundoran team captained by Shane McMonagle. 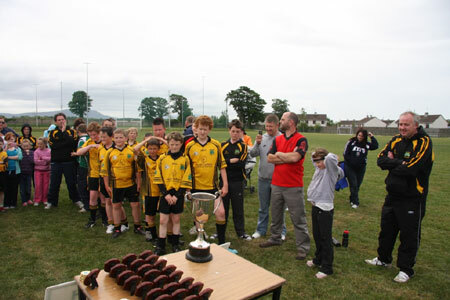 After the B presentations, Willie's son, Barry, presented the defeated finalists, captained by Daniel Warnock, with their runners up medals, before presenting the Willie Rogers trophy to the Erne Gaels joint captains, Michael Herron and Dara Dolan. 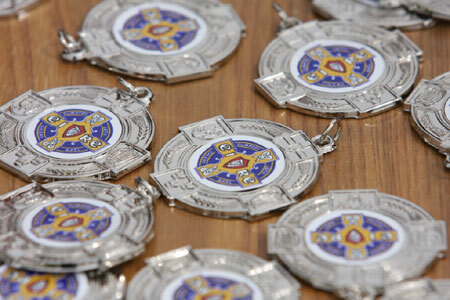 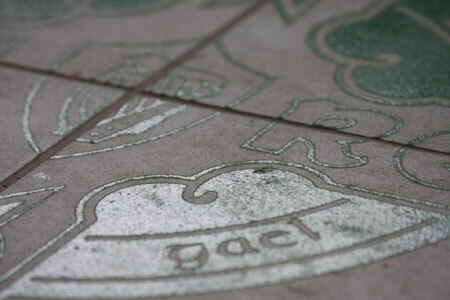 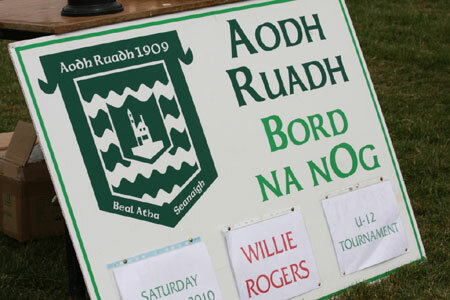 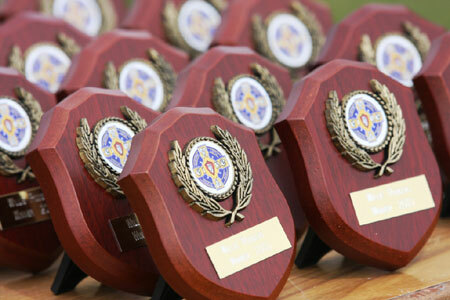 Aodh Ruadh would like to extend their sincere thanks to the participating teams, to those who officiated the matches, Shane Toolan, Val Murray, Terence McShea and Barry Keaney, those who provided the refreshments, the stewards and to all those who gave of their time and effort to make the event such a success.